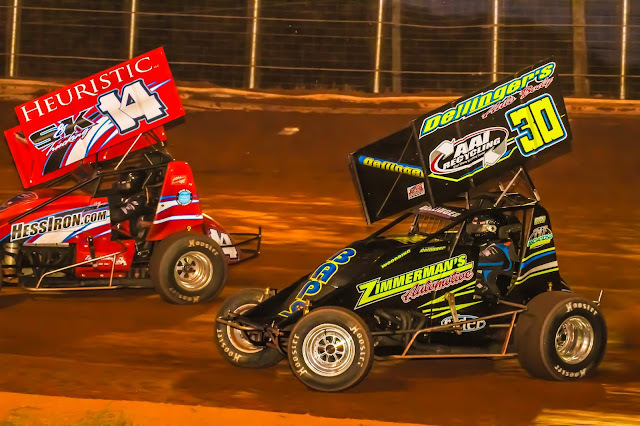 Not only was Dellinger looking for another satisfying win in what has been a stellar season so far at BAPS Motor Speedway, he wanted that six-foot sub from Rock-It Pizza that is presented to the feature winner. That was motivation enough. Dellinger started 11th on the grid and charged to the front in 14 laps to drive away for the victory in the 25-lap Super Sportsman main event. It was his sixth win of the season and 12th overall at the speedway. A caution on the opening lap helped Dellinger move up a row, not that he needed it the way his car operated through the feature event. While Dellinger made his way to the front, Matt Ondek and Paul Miller battled up front. Ondek led the first lap before Miller took over the top spot on Lap 2 and held it through the sixth circuit. But Ondek wasn’t done. He stayed with Miller and surged into the lead on Lap 7, as Dellinger started to compete in the top five. “It’s a demanding racetrack,” Dellinger said. “It definitely helped to move up a row. It may not seem like much at the beginning, but it’s one more car you didn’t get caught behind or lose one more lap with. Fourth-place starter Timmie Barrick unseated Ondek at the front on Lap 11, but he couldn’t fight off Dellinger, who was on pace for another win. A caution on Lap 15 made it easier. Dellinger blasted by Barrick on the restart and was able to build a little bit of a cushion by the time the caution was displayed on the 17th circuit. “The last couple of weeks, Timmie Barrick’s been there,” Dellinger said. “He’s due and is not far off it. He was a tick different from where he needed to be tonight, and that’s where we capitalized. Dellinger put it on cruise control from there. Three more cautions slowed his pace, but no one in the field could match his speed around the half-mile oval. Barrick settled for second, with Miller holding third. Kenny Edkin started ninth and came up to fourth, with Ondek completing the top five. Mike Enders advanced from 23rd to eighth to earn Aero Wings Hard Charger honors. Bruce Buckwalter Jr., Frankie Herr, and John Edkin were heat winners for the 24-car field. Nate Young was named the ArtWerks Hard Luck Award winner. Chad Smith took the lead on Lap 3 and was declared the winner of the Morgan Paving/Aqua Fun Pools Street Stock main event. The race was stopped with 11 of 20 laps complete due to the 45-minute time limit. Brian Walls led the first two laps before Smith, who started fifth, took over on Lap 3. There were nine cautions in the first 11 circuits, which led to officials checkering the event. Eric Tripp, Chris Derr, Bob Scott Jr., and Jimmy Combs completed the top five. Jasen Geesaman, Derr, and Jason Townsend were heat winners for the 28-car field. Dustin Hollinger won the consolation. Alex Updegraff took top honors in an entertaining 20-lap Super Homes Extreme Stock A-Main to close racing action. Updegraff started on the pole and led the first two laps before being passed by Sam Rial. But Updegraff never lost touch of the leader and regained the top spot on the 18th circuit to take the victory. Rial, Patrick McClane, Travis Horan, and Michael Goodwin completed the top five. Horan and Rial were heat winners for the 20-car field. Alex Bright took the lead on Lap 12 from Brenden Bright and cruised to the win in the USAC Midget main event. Adam Pierson, Brenden Bright, Ryan Wilson and Andrew Layser completed the top five in the 10-car field. Super Sportsman Feature Finish, 25 Laps: 1. Scott Dellinger; 2. Timmie Barrick; 3. Paul Miller; 4. Kenny Edkin; 5. Matt Ondek; 6. Davey Walsh; 7. Jay Fannasy; 8. Mike Enders; 9. Justin Foster; 10. Garrett Williamson; 11. Adam Wray; 12. John Edkin; 13. Luke Deatrick; 14. Dave Hollar; 15. Dan John; 16. Nate Young; 17. Todd Leonard; 18. Chase Gutshall; 19. Chad Criswell; 20. Tom Wyckoff; 21. Frankie Herr; 22. Lanny Hake; 23. Russ Mitten. DNS: Bruce Buckwalter Jr.
Street Stock Feature Finish, 11 Laps (Shortened due to 45-minute time limit): 1. Chad Smith; 2. Eric Tripp; 3. Chris Derr; 4. Bob Scott Jr.; 5. Jimmy Combs; 6. Jim Palm; 7. Sam Leonard Jr.; 8. Randy Zechman; 9. Matt Adams; 10. Ryan Smith; 11. Eddie Richards; 12. Wayne Dutterer; 13. Kevin Kolaric; 14. Brandon Wanner; 15. Kyle Sizemore; 16. Brian Walls; 17. Marshall McMullen; 18. Brad Bingaman; 19. Kevin Sigler; 20. Dustin Hollinger; 21. Bud Witmer; 22. Kyle Martin; 23. Jasen Geesaman; 24. Jason Townsend. X-Treme Stock Feature Finish, 20 Laps: 1. Alex Updegraff; 2. Sam Rial; 3. Patrick McClane; 4. Travis Horan; 5. Michael Goodwin; 6. Jeff Gill; 7. Donnie Broderick; 8. Ronnie Grinestaff; 9. Howard Williams; 10. John Frye; 11. Scott Arnold; 12. Gordie Marshall; 13. Richard Daughtrey; 14. Kyle Emig; 15. Ronnie Buck; 16. John Wright; 17. Will Long. USAC Midget Feature Finish, 15 Laps: 1. Alex Bright; 2. Adam Pierson; 3. Brenden Bright; 4. Ryan Wilson; 5. Andrew Layser; 6. Kenny Miller; 7. Shawn Jackson; 8. Brett Arndt; 9. Chris Dyson; 10. John Anderika.